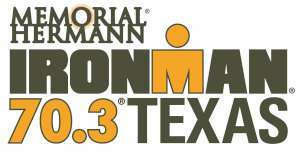 I signed up for the Memorial Hermann Ironman Texas 70.3 in hopes of qualifying for my pro card. The course seemed to fit my strengths with a flat, but notoriously windy bike, and a flat run. The race did not disappoint with some incredible gusty winds that even scarred some of the top pros into switching to shallower front wheels. The weather was hot and humid as expected, but nothing out of control. 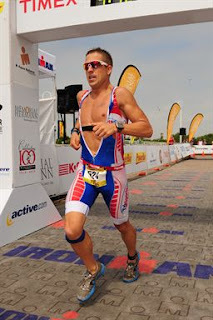 Here is a summary of my race. Swim (29:06): The swim for this race takes place in a protected inland bay. It is a good thing because on this day we would have never been able to swim in the ocean. The one downside is the water was very warm but still "below" the cutoff temps. As a result I knew overheating could be a problem and swimming efficiently became the number on priority. Lucky for me the swim wasn't too chaotic and I stayed relaxed making quick work of the swim. Bike (2:18:49): The bike was nothing but a complete disaster. It started with me dropping my Oakley Radar's within the first 1/4 mile of the bike. I had thought about abandoning them, but given the cost and chance of penalty, I wisely decided to turn back and pick them up. That mistake cost me a good minute and I was not pleased. As a result I biked hard to try regain from the setback. 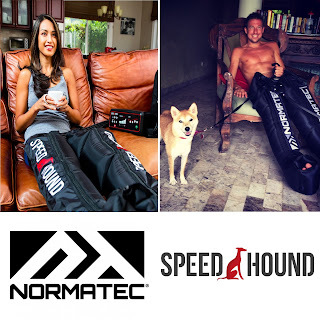 Thankfully there was no shortage of power in my legs as I moved quickly from athlete-to-athlete. As I approached the turnaround I started to count age-groupers. There were only five of them and all five were from M2529. Because that age-group started either 10 or 15 minutes ahead of me, I knew I was absolutely crushing the bike and was easily in first place. All was good. I hit the turnaround and rolled through. Shortly after I heard the dreaded "psssssing" sound and I knew I had a flat tire. I could have almost cried, but I stayed focused on fixing it. I got off my bike and grabbed a can of Pit Stop and hastily injected it into the tire. The Pit Stop started spewing back out so I put my finger over it and waited. After 4 minutes of spewing and slowly leaking down, I was relieved to find out that the tire had finally sealed with an estimated 20 psi. It wasn't great, but it was better than nothing. For the record, I later found out that someone had tacked the course. I got back on my bike and pedaled with fire in my legs. The wind was gusty and the low psi was causing me to fishtail everywhere. The fishtailing was manageable on the flats, but became a dangerous problem in the last two miles of the course. The last two miles were filled with lots of 90 degrees turns and my tire was now completely flat. I missed a critical turn off the seawall and had to overshoot it by a 1/4 of a mile. It was frustrating, but yet another mental mistake on my part. I rolled into transition and I was just thrilled to arrive crash free. Run (1:24:34): I knew the run was going to be hot and humid and the course did not disappoint. I got on the run and settled in nicely with a good strong rhythm. Some of the male pros were on their 2nd or 3rd lap and I was passing a bunch and feeling good. I continued on and was having a good run but it was too little too late. Towards the end of the 3rd lap I got passed by Chuck Sloan - I tried to hang on, but his pace was too quick. I gave it everything I had as I charged hard into the finisher's chute. 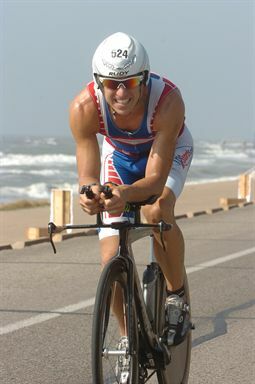 Overall (4:15:31): Overall I had a great swim, a great bike, and great run. I could have not been more happy with my performance today, and despite the disasters I still landed on the very competitive M3034 podium. Flats are part of racing and I can assure you I will use this as motivation as I focus on my next race.